It was because Keegan so believed in his Falstaff as Falstaff believes in himself that we embraced the character and enjoyed the scrapes he got into at the hands of the two merry wives. 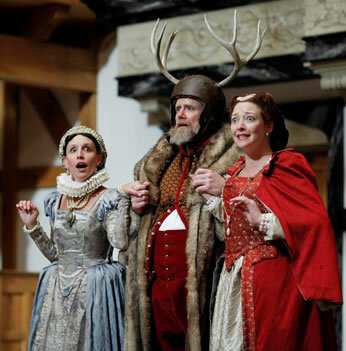 Denice Burbach as Mistress Page, James Keegan as Falstaff, and Sarah Fallon as Mistress Ford in The Merry Wives of Windsor at the Blackfriars Playhouse. Photo by Tommy Thompson, American Shakespeare Center. This play requires two things above all else. One, an understanding that this is not great Shakespeare, it is craftsman Shakespeare. The legend that he wrote this play in 14 days at Queen Elizabeth's request has merit in how shallow a play it is. Look not for resonating poetry or psychological plunging in this play, but do look for multidimensional characters carrying out clever comic set pieces. Two, it requires a well-acted Falstaff. James Keegan was a great Falstaff. Despite being rotund (this production didn't make him grossly so), he was yet nimble—he is, after all, a knight and a cutpurse. He's a player, too—or, at least, he thinks he is, and so Keegan had him preening in his own definition of charm not only to the other characters on the stage but also to the audience in his soliloquies. Whether he was (in his mind, at least) seducing the two wives, scamming Master Brooke, bullying his gang, flirting with Mistress Quickly, or railing at his misfortunes—with or without the slapstick gags—this Falstaff never tipped into hamming caricature. It was because Keegan so believed in his Falstaff as Falstaff believes in himself that we embraced the character and enjoyed the scrapes he got into at the hands of the two merry wives. The rest of the play, on the other hand, has humor so obtuse or plots so clumsy—the wooing of Anne Page is lethargic, the prank on Sir Hugh Evans and Doctor Caius hard to follow, and thankfully this production dropped their revenge on the Host of the Garter—that productions fall back on concepts or physical humor to get through it all. Jim Warren opted for physical humor, and his cast had the talent to carry it off effectively, particularly Christopher Seiler's Sir Hugh Evans, Allison Glenzer's Mistress Quickly, and Daniel Rigney's perfectly cadenced Doctor Caius. John Harrell used his range to good effect as the alternatingly jealous and contrite Master Ford and disguised as Master Brooke. And here's another shout-out to Victoria Reinsel, who we've already raved about for her performances over this weekend as Lavinia in Titus Andronicus and Hero in Much Ado about Nothing. She played Anne Page In Merry Wives, a key character but one seldom seen. However, those few moments Mistress Anne was on stage, Reinsel fully fleshed her out. She also played her brother, William Page, in an over-the-top reading, but her turn as Caius' servant John Rugby was good, fun, physical humor. Reinsel's range shows potential, but her resonance of character—whoever that character may be or whatever that character encounters, from being pursued by silly wooers or stood up at the altar because of mistaken identity or being raped, mutilated, and muted—already makes her a star.